March 12, 2017 By This post may contain affiliate links. These salty and sweet Easter Bunny Pretzel Twists are so darn cute and easy to make using heart shaped sprinkles, chocolate jimmies, and black candy pearls. Add them to your Easter baskets, bag them up and give as gifts, or just add them to a candy dish. They will surely brighten up your holiday. Being you loved my Pretzel Bunny Butts so much, I thought I’d create another sweet little pretzel treat for Easter using sprinkles as decorations. 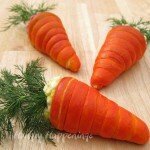 I know bunny pretzels are a popular snack to make at Easter and I strive to create unique treats to share with you here on Hungry Happenings, so when I set out to create these sweet and salty Easter candies, I had to find a different way to decorate them. 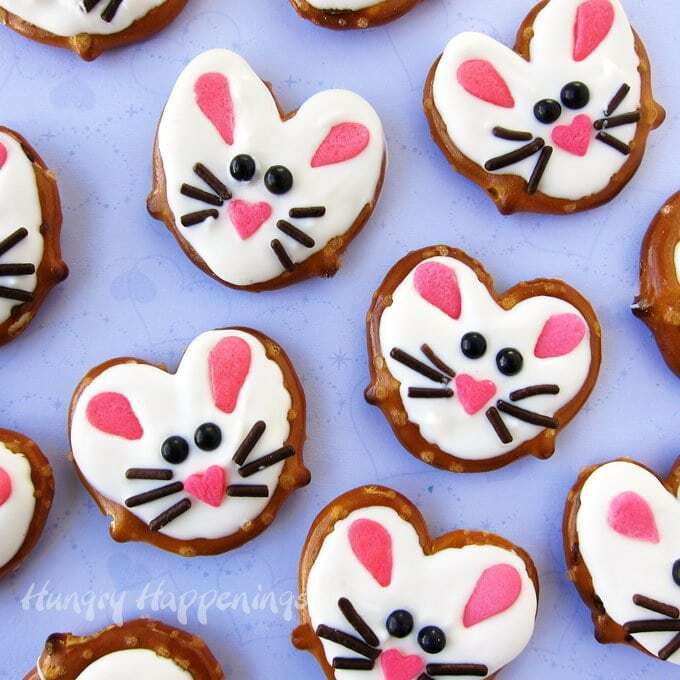 If you do a Google image search for bunny pretzels, you’ll find dozens of of them decorated using food coloring markers, pink taffy, candy coated sunflower seeds, Jordan almonds, Candy Melts, and more, so coming up with something different was definitely a challenge. 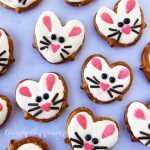 I tore apart my kitchen, pulling out every candy that I could think of to create pink ears, a cute nose, whiskers and eyes for my bunny pretzels. In the process I knocked over not one, not two, but three bottles of round candies that went rolling all over my kitchen. Can you say, “klutz”? Yep, that’s me! After over an hour I had an entire tray filled with reject pretzel bunnies, but I finally fell in love with the perfect design. As I was making the treats over and over again, I noticed that once filled with white candy melts, the mini pretzel twists looked like hearts. In that instant, I grabbed several different sizes of heart shaped sprinkles and decorated the final version of the pretzel bunnies. For the nose I used a small pink heart sprinkle and it was perfect! Then I looked at my jar of jumbo heart sprinkles and realized that broken in half, the hearts would make perfect ears, and they did. It was a bit of a challenge to get each and every jumbo heart sprinkle broken exactly in the middle, but I did always get at least one ear from each heart. If you have trouble, you can use a pair of scissors to cut off any jagged edges. For the whiskers, I saw other’s using black food coloring markers and candy melts, but I loved the clean look of the chocolate jimmies. I found that adding them using tweezers was just as quick as piping or drawing them on. Finally I tried out all different sizes of royal icing eyes, mini chocolate chips, and mini M&M’s and chose black sugar pearls which reflect the light in the room and give the eyes nice highlights. 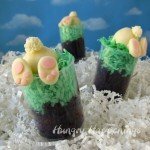 As you are decorating these Easter Bunny Pretzel Twists, you will need to spoon white candy melts into one pretzel at a time then add your decorations. The candy coating needs to be wet in order to get the sprinkles to stick. If you use a small bowl to melt your candy melts you will probably have to continuously heat it up in the microwave to keep the candy coating nice and melted. I opted to keep my candy melts warm in a Wilton Melting Pot. You can melt the candy melts right in the pot, or if you are in a hurry, you can place the candy melts in the silicone bowl, remove it from the outer melting pot and microwave it. Then place it back in the warmer, set the temperature to low, and keep it melted while you work, never having to go back to the microwave. If you use the high setting to melt your candy wafers, be sure to stir them often, otherwise they can burn. If you go off to do other things, then keep the pot set on low, then there is no risk of burning. Watch the video tutorial to see just how easy these Easter Bunny Pretzel Twists are to make. 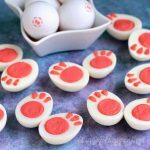 You can find the supplies need to make your own Easter Bunny Pretzel Twists from Amazon (commission earned for sales). Sweet and salty candy coated pretzels decorated with sprinkles to look like Easter bunnies. 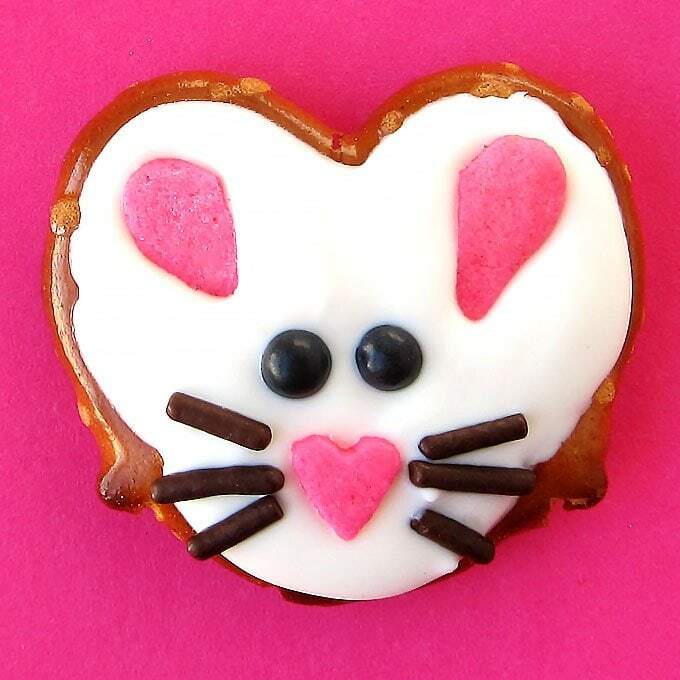 Pour a small spoonful of white candy melts into the center of each pretzel creating a heart shape bunny head. Immediately add one pink heart sprinkle nose near the bottom of the pretzel. Add 3 chocolate jimmies on either side of the nose for the whiskers. Place two black pearl eyes above the nose then add the two broken halves of the jumbo heart sprinkles for the centers of the ears. Repeat creating a few more then pop them in the freezer for 3-4 minutes until the candy hardens. 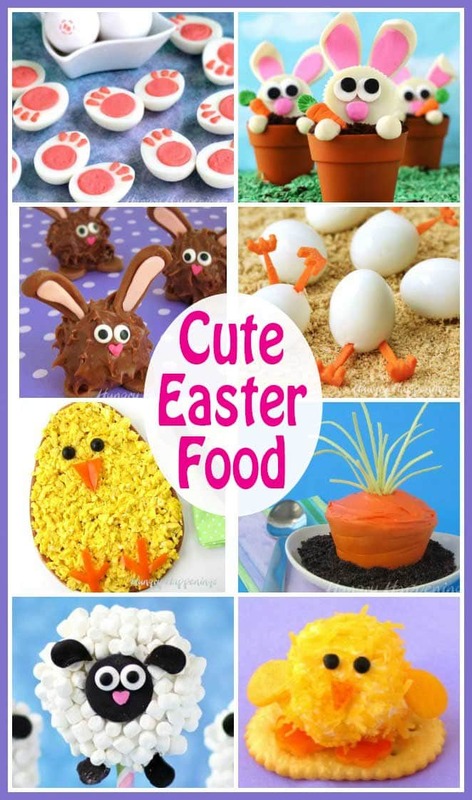 Continue making bunnies until you have 72 adorable Easter treats. 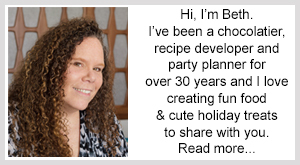 See my Chocolate Making Tips page for melting instructions. If your Candy Melts are thick and aren’t spreading nicely in the pretzels, thin them out using Wilton EZ-Thin or paramount crystals. 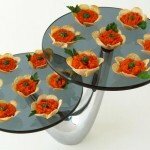 Use tweezers to add your decorations but be sure they are sterilized if they’ve been used for any other application. I keep sets in my kitchen for food use only. 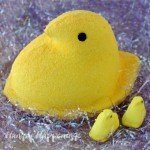 They are cheap and make a great addition to your kitchen supplies. Be sure to keep your black pearls in a bowl and keep the lid on the jar so you don’t knock them over and have the spill all over your kitchen, like I did! 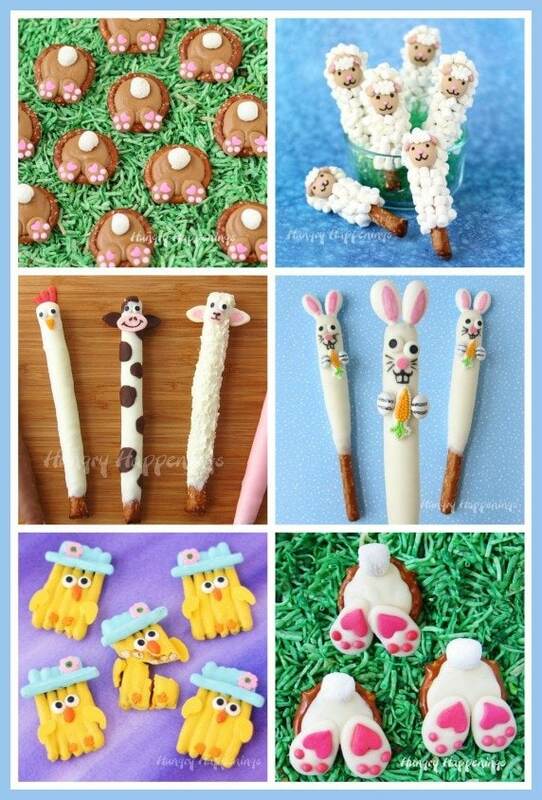 If you like these Easter Bunny Pretzel Twists, you might also like to make these other decorated Easter pretzels. 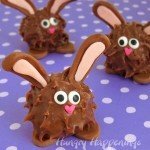 Oh my, you have created a crunchy, salty AND sweet bunny! Love!